The Sound Relationship House theory is the basis of couples work and couples intensives. There are seven parts of the Sound Relationship House. This is the framework for Gottman couples therapy work. Each of these levels involves the need to build a fundamental process. The first three levels of the house describe the essential components of your friendship. Build Love Maps. Maintain awareness of your partner’s world. It’s about how well you know one another—how well you know your partner’s inner psychological world, his or her worries, stresses, joys, and dreams. You do this by asking open-ended questions. It involves you periodically updating this knowledge. This also includes building knowledge of your partner’s changing sexual map. Share Fondness & Admiration. Make deposits into the Emotional Bank Account of your relationship. It is the antidote for contempt. You do this by changing a habit of mind. Instead of scanning for your partner’s mistakes, scan for what your partner is doing right and thank them for it. This builds a culture of appreciation, fondness, affection, and respect, thus increasing the amount of affection and respect that resides within a relationship. Turn Towards. Accept bids for emotional connection. The small moments of everyday life are actually the building blocks of a relationship. A partner may either turn toward, turn away, or turn against a bid from his or her partner. A bid is a gesture—verbal or nonverbal— for some sort of positive connection: conversation, humor, affection, or support. The very small everyday moments in a relationship are opportunities—opportunities for turning toward one another, opportunities that can build the Emotional Bank Account. The Positive Perspective. A positive perspective occurs when the friendship in your relationship is strong. To change that state, you need to build your couple friendship, using the first three levels of the Sound Relationship House. This level represents what it feels like in the relationship. Whether it is positive or negative determines the presence of positive attitudes in problem-solving discussions and the success of repair attempts. Manage Conflict. We use the term “managing” conflict rather than “resolving” conflict because relationship conflict is natural and it has functional, positive aspects. For example, it helps us learn how to better love and understand our partners, deal with change, and renew courtship over time. We try to manage but not eliminate conflict. Discuss your problems. Take turns in listening to one another. Listen to your partner’s underlying feelings and dreams. 69% of couples’ issues are called “perpetual problems” due to differences in personalities, lifestyle needs and values. Learning to dialogue about these problems is important. Practice self-soothing. Keep yourself calm. 6. Make Life Dreams and Aspirations Come True. Find ways to support each other’s life goals and dreams. A crucial aspect of any relationship is to create an atmosphere that encourages each person to talk honestly about his or her dreams, values, convictions, and aspirations and to find ways to honor at least some aspect of them. This includes play, fun, and exploration/adventure. Create Shared Meaning. Build a shared sense of purpose. What is your mission and legacy? This level of the Sound Relationship House is about creating shared meaning by talking about: • Rituals of Connection (formal and informal) • Shared goals • Supporting each other’s life roles • Agreeing about basic symbols such as what a home means. We believe that every committed relationship is a cross-cultural experience in which we blend together each partner’s legacy, culture, values, and beliefs to create an entirely new culture. We are all meaning-makers and story-tellers. The Sound Relationship House also has two walls, Trust and Commitment. Make trustworthiness a main priority in your relationship. Act to maximize your partner’s well-being. Know that trust is built in small, positive moments. Generate frequent thoughts and acts that cherish your partner’s positive qualities and minimize your focud on their negative qualities. Commitment means believing (and acting on the belief) that this relationship is a lifelong journey, for better or for worse (meaning that if it gets worse you will both work to improve it). It involves cherishing one’s partner’s positive qualities and nurturing an attitude of gratitude about what one has with this person and comparing him or her favorably with real or imagined others, rather than trashing one’s partner by magnifying his or her negative qualities and nurturing resentment by making unfavorable comparisons. 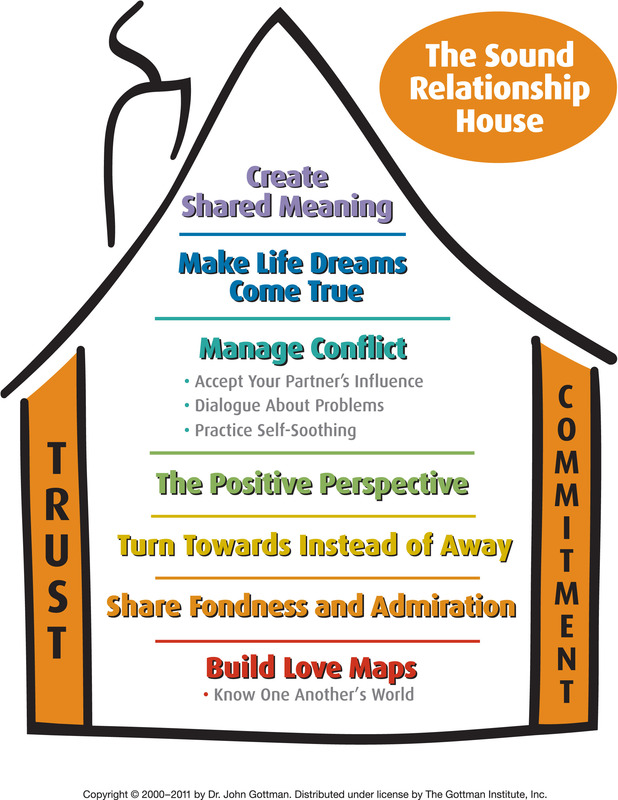 During Gottman couples therapy and two day intensives, these seven levels of the “Sound Relationship House” are our guide. The Gottmans are grateful to the three thousand couples who, through their participation in our research, gave us the secrets for how to build strong and lasting relationships. It is these skills and strengths that they wish to impart to you.